This advice was passed on to me by my former boss and mentor, Ilse Treurnicht at MaRS. I think about what matters to me quite a bit so it was no accident that I landed at ORION over two years ago, excited by how it supported Ontario’s innovation agenda. 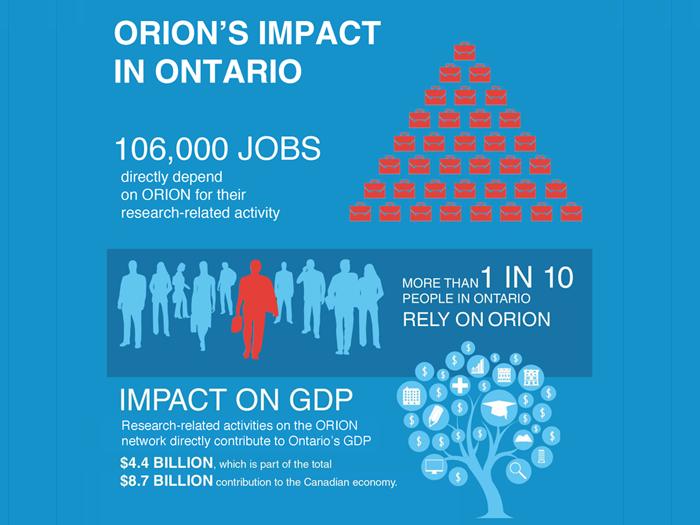 As a high-speed, fibre optic network stretching 6,000 kilometres across the province, ORION is a partner connecting over two million users in Ontario’s research and innovation community. We’re a catalyst, accelerating the kind of innovation economy we need to improve everyone’s standard of living. And we’re an innovator, operating one of the largest and fastest RE&I networks in the world, enhanced with valuable services to unleash the creativity of our users. But not everyone really understands what makes ORION different. It’s understandable. “It’s like the air we breathe,” says Robert Lukes, Vice-President, Research and Innovation, George Brown College . For many people, they just do the unique work they do every day: analyzing the vitals of premature babies on the path to improving health outcomes, mapping the human genome to better understand how to prevent cancer, streaming international experts into their classrooms to inspire the next generation of Einsteins. They don’t have to think about how it works — it just does. But what would you do if the connectivity wasn’t there? Collaborations would stall. Analysis of vast waves of data — impossible. Our diverse experiences from across the globe — lost. But all that, while important to consider, was just anecdotal understanding for me. We’ve been working with the Conference Board of Canada to understand our impact on the innovation community in Ontario. And what we found out is that our network has a concrete, quantifiable impact on this province through the work ORION’s network enables. The effect so staggering, I was humbled. How could we possibly quantify the spill-over effects as researchers collaborate globally? The number of lives saved through health innovations developed in our universities? The energy saved though creations of bright-thinkers in our colleges and startup incubators? The expanded minds of our children? Today, as we work to expand and enhance our network and services, we are reminded why we do this. We do it for you. To keep your air flowing. 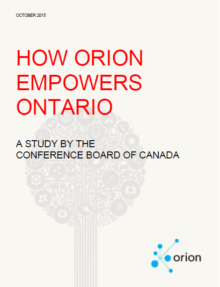 Find out what the Conference Board of Canada found out about ORION’s socioeconomic impact on Ontario.